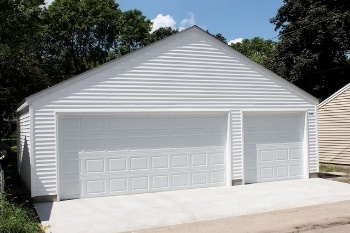 We're proud of the garage designs and styles we build. What can we build for you? As you will see in the following pictures, Western Construction is the most trusted garage contractor in the Minneapolis St Paul area. 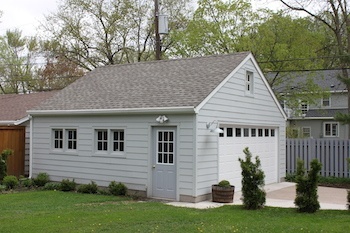 We've built tens of thousands of garages in just about every shape and size imaginable. 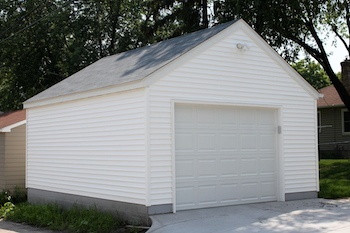 The level of quality craftsmanship and materials is clearly visible on every garage we build. There's no such thing as a standard garage design anymore. For instance, a standard design in the Highland Park area of St Paul might be similar to a garage by Lake Calhoun in Minneapolis but completely different from a suburban St Louis Park style. As you view the different garage designs, plans, trusses, pictures, styles, and descriptions, keep a note pad handy and write down what designs you like and as important, what designs you don't. After viewing what your neighbors in the Minneapolis St Paul Twin Cites MN have built, give Western Construction a call at 952-920-8888 or fill out our contact form so we can turn your dreams into reality. If you want a new garage but don't want to break the bank then this 2 car detached garage style is perfect. 16x7 North Central Garage Door, Vinyl siding and aluminum soffit and fascia and architectural Shingles. 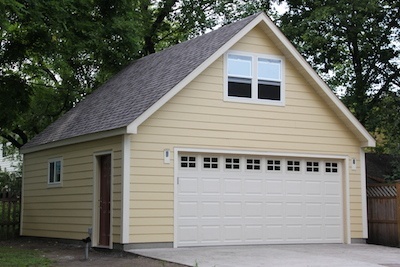 These South Minneapolis homeowners really like all the light brought in by using windows everywhere in their garage. The overhead garage door, front gable end, service door and 2 sets of beautiful barn sash windows finish off the list. 32' x 22' 3 car garage with 16x7 and 8x7 overhead garage doors, vinyl siding, 7/12 spread web storage trusses complete with floor and folding attic ladder. 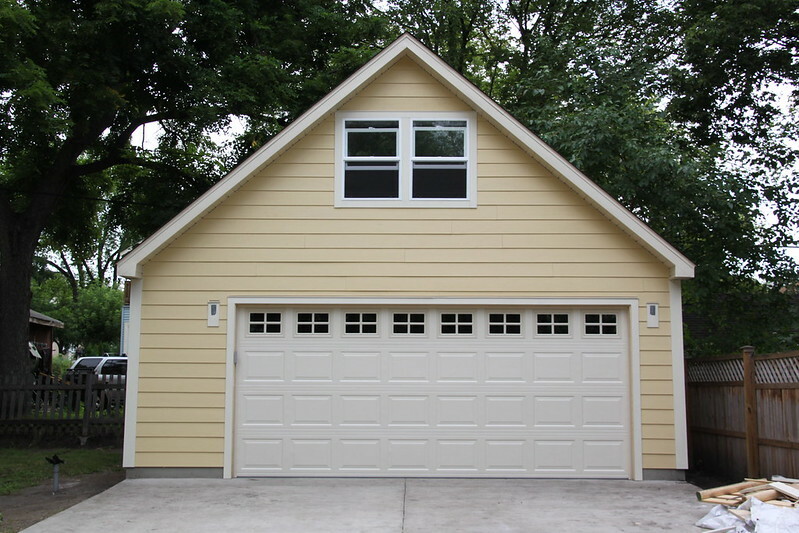 This St Louis Park, MN garage had to match their home exactly so the homeowners decided to pay the substantial up charge for stucco siding. Everyone in the neighborhood was glad they did. This is the perfect single car garage size. 16x22 with a 9x7 overhead garage door, vinyl siding aluminum soffit and fascia and architectural shingles. 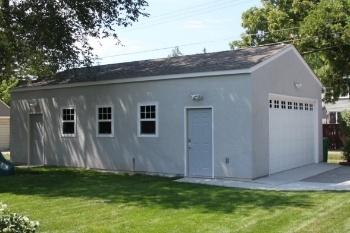 If you need lots of storage, home office, or a place to get away, then this is the perfect garage for you. 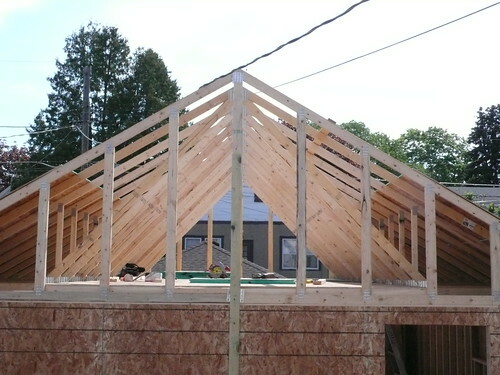 10/12 attic trusses, inside staircase, LP SmartSide Tex lap siding and single hung windows. 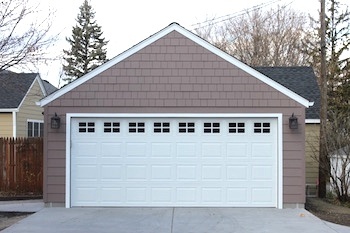 A nice design feature is using James Hardie shingle siding in the front gable and lap siding for the rest of the garage. This adds style without added cost. Most of the time we offset the overhead door to one side to maximize the interior storage space. 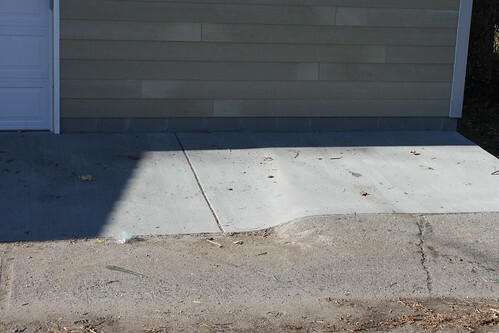 This alley was so steep we decided to center the overhead door for easier access. The owner of this beautiful garage was a photographer with a keen eye for design. He wanted something distinctive but maintenance free so we choose Kaycan Vertical siding and it looks fantastic. 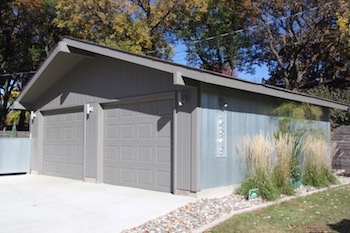 The owners of this Richfield Minnesota garage wanted a style that was reminiscent of their extensive travels out west. 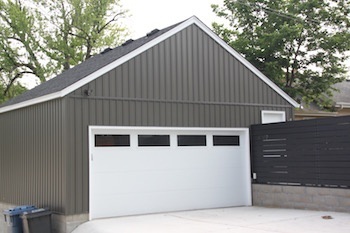 They used a butterfly style gable eave on the front of the garage, vertical metal siding on one side and LP SmartSide siding on the rest of the garage for a very distinctave look. 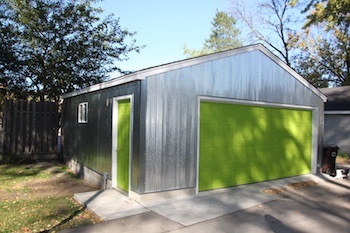 This Minneapolis homeowner wanted vertical metal siding on the entire garage. 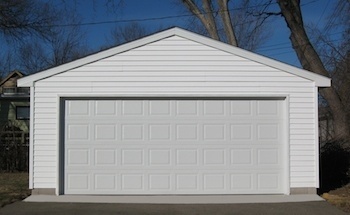 We used primed steel garage doors so he could paint the doors any color he chose and white aluminum soffit and fascia. 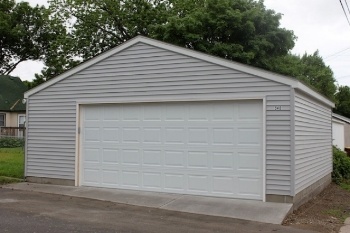 Standard 24x24 detached garage. 16x7 overhead door, vinyl siding, aluminum soffit and fascia and we were able to use the old driveway. 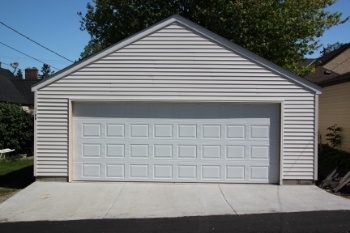 Our custom garages are available in any size, shape and style imaginable. If you see a style you like in a one car garage but you want a 3 car what should you do? 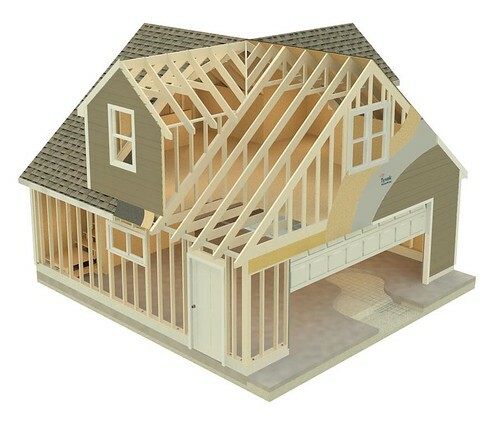 If you don't see the size, shape or style garage your dreaming about, what should you do? The answer is simple, give Western Construction a call @ 952-920-8888 or fill out our contact form and one of our designers will listen to your ideas to create a beautiful custom garage that reflects your vision for that one of a kind statement.